Lion Al Granger, Publicity Chairman, presents our newly refurbished "Lions Meet Here" sign to the Lead Waitress at the Golden Corral Restaurant. The sign is an important publicity tool that tells everyone who visits this great dining establishment that Lions Meet Here! 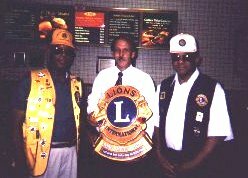 Lion Ron Brown (left), Craig Riha, Manager of the Golden Corral Restaurant (center), and Lion George Rogers with the "Lions Meet Here" sign. The sign was re-painted by local artist Kenny Hobbs. The sign is now displayed in a prominent place in the restaurant.